Redford, MI isn’t a huge city filled with a lot of tourist attractions. In fact, it is a medium-sized city that is ever-growing, but not a common vacation destination. Located as a suburb of Detroit, Redford has plenty of dental offices to offer you if you’ve recently decided to call this city home. Emergencydentistsusa.com has put together a list of dentists that are available in and around Redford, MI. You can go to our site and quickly view the office hours, some of the services that they offer, the types of insurances that they accept, and any discounts that may be available if you don’t have dental insurance. We make it simple and fast to find an available dentist when you need one. If you don’t have access to the Internet, then you can call our toll free 24-hour dentist finder hotline. One of our friendly, knowledgeable operators will be glad to assist you with finding the dentist that is right for you. Once you determine the office that you would like to visit, the agent can set your first appointment for you and also provide you with directions to your new dentist. When you’re heading out to your first appointment, make sure that you arrive about 15 to 20 minutes early. All offices require new patient paperwork on a patient’s first visit. With that being said, make sure you also bring a valid ID, a copy of your insurance card, a list of any current medications or allergies, and any copay that may be due at the time of service. Redford, MI is a moderately populated city, so with that comes plenty of dental and doctor practices. From pediatricians to Orthodontists and oral surgeons, there are many different types of doctors to choose from in the area. If you’re experiencing any type of pain, it won’t be hard to find one that can see you quickly and assess the situation. Description: Sunrise Dental Care is proud to offer their patients general and cosmetic dentistry. They like to treat each of their patients as though they are family. With a 24-hour answering service, you can be rest assured that all of your calls will be answered as quickly as possible. Grand River Family Dentistry: Azzouz, Abraham D.D.S. 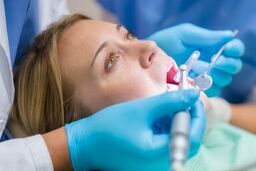 Description: The team at Grand River Family Dentistry is glad to offer their patients general dentistry at prices that are affordable. They are even available for emergencies if you experience a traumatic dental injury. Their caring and compassionate doctors take pride in teaching patients how to make their smiles last a lifetime. Description: Dr. Daws and his team do their best to make each patient comfortable when they come in for treatment. They enjoy teaching about preventative maintenance while working with the patient to achieve the healthiest smile possible. With extended hours during the week, they strive to meet the schedules of even the busiest patients. Tooth pain is always uncomfortable and it is never a pleasant experience when it happens. If you’ve had persistent pain that has lasted longer than one or two hours, then it is time for you to go to an emergency dentist. If you haven’t bumped your mouth or experienced any other type of trauma, then tooth pain will likely mean that you have an infection in your mouth. It’s important that any type of infection is treated immediately and not disregarded. If you don’t treat it quickly, then you risk additional teeth as well as your gums becoming infected. It will be a lot more expensive and painful if you put off treatment. It’s always best to be safe when you’re visiting a new dentist or doctor and check their credentials prior to your appointment. You want to make sure that the person you’ve chosen for help is properly licensed and qualified to take care of your dental needs. Most offices will have this information on display when you go for your visit, but you can also easily check prior to going in. Enter your doctor’s name on the Michigan Dental Association website to quickly view their information.